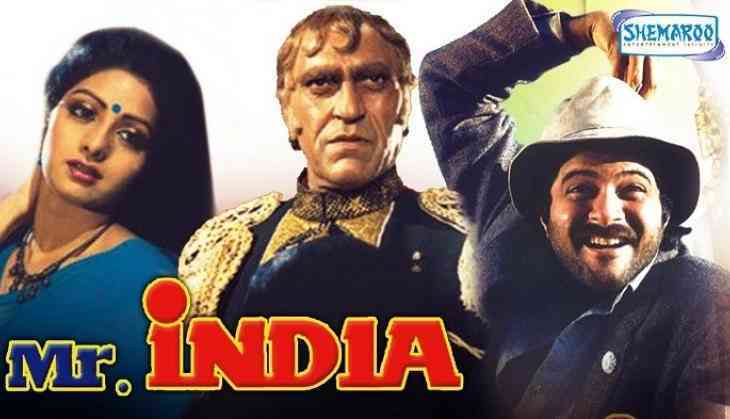 The 1987 superhit film 'Mr India' completes 30 years today and producer Boney Kapoor says the makers focused on the story rather than depending on the stardom of the lead actors. Touted as Bollywood's first sci-fi film, 'Mr. India' starred Anil Kapoor in the titular role, Sridevi, Amrish Puri as the famous villain Mogambo, went on to become a highest grossing film of 1987. 'I'm so happy and proud that people remember 'Mr India' fondly even today. With 'Mr India', we were never dependent on the stardom of the actors, just on the magic of the film,' Boney said in a statement issued here. 'All our fight sequences, stunts and the destruction, it was real-time direction and special effects; it was not done during post-production,' he says. 'I remember being one of the youngest members behind the camera and today with my upcoming film 'Mom', I am the eldest member,' he says. Directed by Ace filmmaker Shekhar Kapur film had several memorable moments and characters like the idea of an invisible man (played by Anil as Arun) struck the chord with the audience. The 10 child artists played an integral part while Satish Kaushik as Calendar left everyone in splits. The film was known for several of its one-liners and songs, including Sridevi's 'Miss Hawa Hawaii' performance, and Amrish Puri's famous dialogue 'Mogambo khush hua'.